Testimonials | Edie, The Salsa FREAK!! Last year ended positively whereby even a salsa buddy video taped me dancing. Some of the girls profusely compliment me that they love dancing with me and frankly I am still using basic patterns and not any complicated combinations because I “cant” since I dont practice them. I spent time in Toledo with my brother last year which has a small salsa scene and I guess “one eyed man is king in blind man country” ( a Trini saying) and I have heard the same comment from a few ladies. I definitely am more confident and have a good time and dont stress on comparing myself to the guys with all the cool moves- I keep it real simple and try as much as possible to show up the lady so that she is the star with a lot of those one hand cross body leads so that she can style. Subconsciously I think I have been channeling your teachings Edie but I havent been practising other than attending socials. I actually started kizomba which I like but even that I keep basic. I am rambling but wanted to give you kudos because without realizing it, I improved drastically thanks to our training together. I really look forward to the opportunity to spend another 48-72 hours with you to take it to another level but in truth, I am not even stressing on trying to learn how to do cool combinations because now it seems as if at least 50 pct of the “ new” ladies I dance with, I need to simplify or reduce my moves to dance to a level that they are comfortable with and can execute but that’s crazy since I feel like I am doing the same old bread and butter moves so how can that be Edie? Just to congratulate you, because your style is amazing and my wife and me are fanatic of your style. We got your DVDs and we are practicing so much and also teaching the things i learned from your DVDs. I wish to be in contact with you, if you have MSN messenger let me know please because my students and me want to know you some day personally. Visit Cusco Peru some day you will have a place to stay. Hi I am finally leaving school. I am doing okay I am a little sore but no pain no gain right? I think your brace is amazing! It is definitely not like anything else on the market. I hope your doing well. Definitely recommend! They have a well-organized and structured curriculum, and an interesting and effective martial arts alike system, you need to test out to go to the next level~ Both dancing on one and on two are taught. During my time here I learned all my basics, and many other things, like ladies styling, spinning techniques, musicality, and connection. I also made a lot of friends. Edie is not only a great instructor, but also a very nice and warm person. The atmosphere here feels like a family. After group lesson they have social dancing, at the same time dinner is provided, usually pizza and a vegetables and fruits. 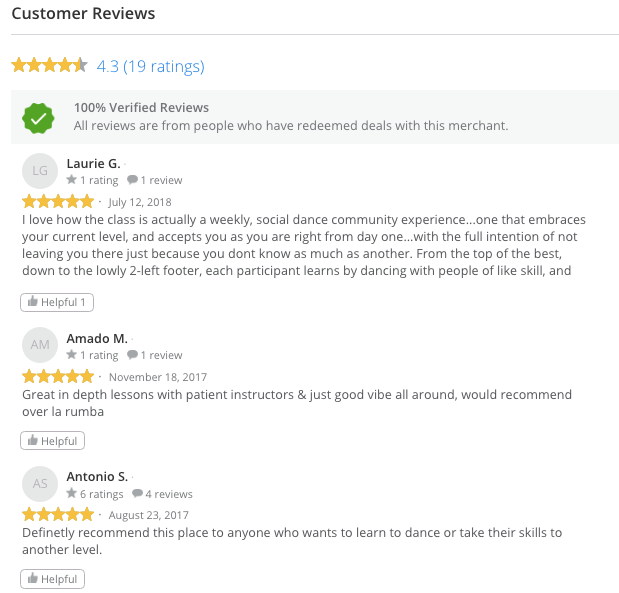 If you are a beginner looking for a place to start learning Salsa(they teach a little bit of Bachata and Merengei too), it’s a percent place to go to. Don’t be intimidated, every one is super friendly. If not a beginner, you’ll be assigned to different level of classes to dance with people with similar level of experience. I like to pick things up from you and try them myself. I am a very fast learner. Hi Sensei! I just wanted to thank you again for everything you have done for me. I feel like I am getting a lot better and I actually really enjoy teaching! Also after having a few lessons with Sensei Favian I’ve realized I absolutely love bachata!!!! I actually started doing salsa because I was extremely depressed and thought trying something new might help. It certainly has! I really can not thank you enough. I’ve been a member of Edie’s Black Belt Salsa (BBS) school for over two years. Her program has enabled me to progress from dreading social events featuring dancing, to enthusiastically seeking out dance events. Edie teaches much more than just dance steps and a series of dance routines. Her students learn the elements of dance, from musicality to learning what men and woman want from a dance partner. Her classes cover everything from learning how to approach a woman for a dance, to teaching ladies who want to dance how to attract men who want to dance with them. Edie’s Black Belt System of teaching Salsa provides students with a solid foundation on which they can build their dance skills. Men learn how to successfully lead a women through a Salsa dance; ladies learn how to hold proper dance frame and styling, so they can feel a man’s lead. 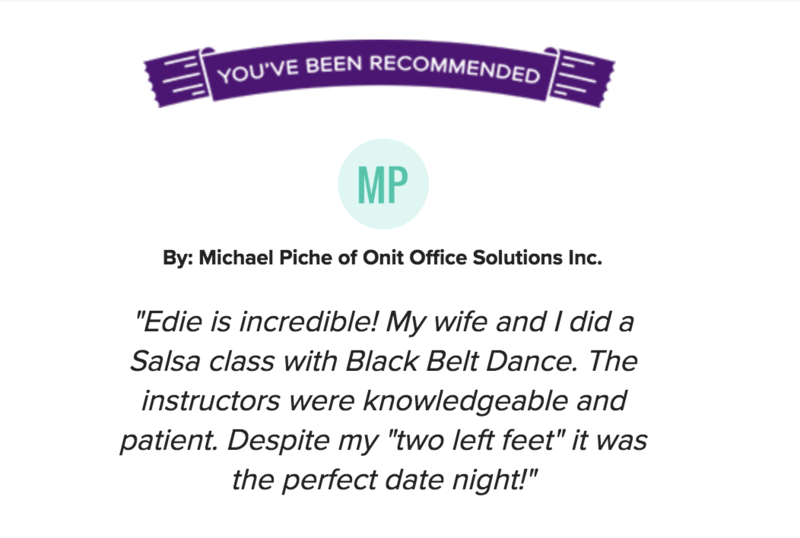 The result of Edie’s teaching program results in men and women being noticed on the dance floor. BBS men are sought out by woman as dance partners, as they have learned how to delight their ladies in leading them in dance. BBS woman learn styling and other dance techniques, that make men notice them and seek them as dance partners. My level of physical fitness and mental well-being has increased significantly since becoming a BBS student. Salsa dancing has increased my flexibility and positively contributed to my weekly physical fitness program. I now count many new friends among BBS students and among the Denver Front Range Salsa community. My new friends are awesome, intelligent, fun loving, energetic people who work hard and love to play hard. My only regret is that I didn’t learn to Salsa dance with Edie long ago. Edie cares about her students, and it shows in their level of dedication to the BBS program and their support of the Salsa and Latin dance community. Thank you for your wonderful letter and words you devoted to us. It is very nice to hear that the festival was great and that you had a great time. We have heard very many good words from people who attended the festival. They liked your workshops; they liked you, your friendliness, and your kindness. I would like to thank you so much for sharing your knowledge and wisdom in the instructor class in Miami. I often think about that and how wonderful God is to have brought you here. I would like to share with you something that I have been working on for some time and wondering if this would be of interest to you or many of the people that you know. I have an online traveling website www.yoursalsatravels.com where salseros and book their travel. I believe that this could be the Microsoft of the traveling industry. I am really excited about this because I believe that it could change the way some of the salsa promoters handle travel when planning their events. Well, tell me if you see what I see. For the company business, go to www.salsatravelbiz.com and go to company presentation. I hope all is well with you. May God’s grace, love and peace be with you. Things here in Bangalore have returned to normal, although I’m still riding this weekend’s high. In retrospect, I realized that the main reason I had such a great time was that I chose to feel good and feel happy. That feeling of joy that I maintained throughout the event was like a magnet for other good things. I made some great connections, got a couple of invitations to other congresses and had a couple of the artists ask if we could work together on some routines! from you again some day. I came across your website while doing searches on “salsa”. I am so impressed with your background, talent and also your warmth and kindheartedness which comes through your published responses to letters. Most importantly, I find that it is no coincidence that I came across your website, because I am a Christian with concerns about how to be a dancer in a predominantly secular world, especially that of salsa, where there is so much temptation. I took my first salsa class on September 25th, only two weeks ago. Since then I attended another class and have been to three salsa dance clubs: the Whittier Radisson, the Granada in Alhambra and Steven’s Steakhouse. What incredible dancers I saw at Steven’s! Wow. I am hooked on salsa! I love the music! Something happened the first time I attended a salsa dance club–that was at the Whittier Radisson on September 28th (how can I forget). What made all the difference was the live band with all the percussions and rhythm–the music just got to my soul! Even though I was a beginner, I felt the music and was able to dance to it. The men were so patient; they taught me how to follow. I danced with one guy for about five songs. It was so slow and simple that I was bored at first, but later on something happened. We got into this synchrony, as if our worlds became one: our movements melded as one as we responded to the music. It was magic! Two weeks later, I’m still thinking about that magical moment. As I read your Stories forum, I discovered that what I experienced was a salsa “fix” or high. It was incredible! I had a high at my first salsa club. We danced together in Lancaster on your way to the DC Salsa congress in the springtime. I ended up buying your Salsa Syllabus 101-102 and 103-106; I like them very much. Thanks for teaching us all how to love salsa…and best of luck my friend and teacher. You did it Edie, BRAVO!!! You really inspire the world of salsa with your courage and beautiful dancing…. I saw one of your DVD’s—it was super. let you know the instruction of the moves is awesome. the music is more enjoyable than obsessing about keeping on the beat. There are dancers where I live who are obsessed with keeping on the beat. They never smile when they are dancing. to me when I dance. Thanks again. You did it Edie, BRAVO!!! You really inspire the world of salsa with your courage and beautiful dancing. I saw one of your DVD’s. They are super—but I have to really practice the spinning. I started salsa four months ago, and I’m already on a high level. But now I have to learn to dance beautifully as a real lady with nice lady moves. Your DVD’s are helping me on my to that dream. Dancing is the celebration of life! – You never know if a bus will hit you! If there was one way I would describe dancing, it is that dancing is truly the celebration of life. Dancing, a magic ritual of energy, danced before our time, during our time and way beyond out time. Dancing though is a way of communicating with our ancestors and predecessors which transcends limitations of time and proximity. Appreciate this. Appreciate the moment and your dancing will always be the best it can be. Yesterday was my new birthday. The 25th May 2007. I am one day old. The night before, I went out dancing as per usual. As usual, it was unusual. Every night is different, but all are fantastic! I awoke that morning, looking forward to riding to work and sharing my stories with everyone on Salsa forums. I thank you all for the help in my ‘improving my lead’ thread as your words and encouragement truly helped and I had many compliments about my VASTLY improved lead. The best compliment of all was that a beginning lady who does not dance much and is not asked much, I imagine because she is a bit bigger, danced EVERY step I knew. Even way beyond what she had been taught herself. What started as me thinking I was doing her a favor in a sense by getting her on the dance floor, turned into her doing me a favor by dancing with me, as she was a SUPERB follower. Her improvement is astounding and inspiring. Best of all, she has the best fashion sense ever. Every week she wears THE LARGEST SMILE ever! The night was electric and full of so much energy that on some big beats whilst I was in guapea, I found myself crouching to the floor and playing the rhythm on the wood and then springing back up keeping in time. Last night I had the BEST night ever. Just FANTASTIC. I danced salsa all night, and even did a meringue. You probably know that already and have known about that for a long time. However, I and many of your students, are quite new to dancing, thus it is an AMAZING discovery for us! I just thought I would take the time to give a MASSIVE thanks to you and your wonderfully assembled team of brilliant instructors. You have successfully managed to assemble some WONDERFUL individuals whose synergy creates a tremendously positive and welcoming environment! Each of you is a positive character in your own right, with individual flourishes which add flavor to everyone’s experience. I truly believe that dancing is the celebration of life! Some of the other students and I were chatting about our great experiences and wonderful times dancing last night and it inspired me to write this thank you email as you and your team cannot get enough credit for the wonderful job that you do! Thanks again for letting me, and many others, appreciate life a little bit more. I look forward to many more great classes and experiences with you and your team. Little did I know that may have very well been MY LAST COMMUNICATION WITH ANYONE WHILST I WAS ALIVE. Seriously, that thought chills me. As I rode to work on my bike, I was cycling straight along a road, close to the gutter. I do this about 30 metres before the bike path begins. All of a sudden, BOOM! I found myself waking up on the pavement some 5 metres away from the road and what was once my bicycle. I got up and was thinking ‘what happened’ and stumbled around. Then the pain hit me. I felt like collapsing but I didn’t as I was completely out of it and could not remember how to collapse. Otherwise I was fine. I was VERY LUCKY. I was thrown from the impact and my bike was destroyed, not me. The impact was so great that, my clip in pedals on my shoes which lock your feet into the pedals, were broken off. Literally the pedals broke off with the force I was thrown back with. As I sat there in the hospital (I had to stay for a while to be monitored because I had a concussion) and waited for my x-rays. I could not help but think ‘WOW, last night (dancing) was so fantastic! If I had to have a last night, dancing is a great way to do it! As comical as it sounds, it makes sense. LIVE LIFE. Don’t wait or hold back. You NEVER know. The girl you want to dance with, ASK! The class you are thinking of doing, GO! The x-ray was positive and no broken bones. It was a miracle, as the Doctor’s said, but I am home now. Bruised up, with my arm in a sling (pulled muscle apparently) some cuts, etc. MOST IMPORTANTLY, I am ALIVE! I’m hoping to go dancing soon; if for nothing else, than to watch.